Maui has been voted the "Best Island" by Conde Nast Traveler for many years. And that's not just the best Hawaiian Island but the best of all Islands! We agree as there is so much to see, to do and to do nothing in this relatively small location. Maui weddings are "ono" in Hawaiian that means the best. For most people Maui is its beaches. Kaanapali and Kapalua Bay on the west shore and Wailea and Makena in the south, Maui has some of the finest beaches in the world. This is where the majority of our clients get married or have their vow renewal. Besides the beach Maui has a great variety of activities and must see drives. The drive to the lush rainforest of Hana is spectacular as is the drive to Haleakala the 10,000 foot dormant volcano. Golf, Hike or Swimm one can have the adventure of a lifetime or just relax and forget the problems of the world. If coming December to March see the Humpback whale migration. Maui sunsets are unparalelled! We host most of our weddings and vow renewals just before sunset as to have a beautiful colorful sky as the last few photo's are being taken. . 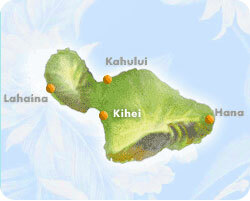 Choose your location: We assist you with your Maui Wedding with wedding location advice. We offer beaches and the requisite permit, parks, waterfalls, churches and other private venues. Choose your vendors: We give you choices for minister, photographer and more... Our vendors have been selected based on experience, professionalism, excellence and their dedication. Choose a package or customize: We offer a variety of pre-determined packages that very popular. These wedding packages can give you an idea of our price but do know we customize the majority of our weddings.